In the years 1849 and 1850, Henry Mayhew was the metropolitan correspondent of the Morning Chronicle in its national survey of labour and the poor. Only about a third of his Morning Chronicle material was included in his later and better known, publication, London Labour and the London Poor. 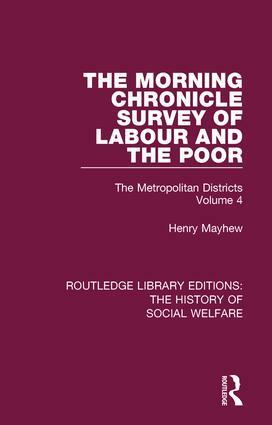 First published in 1981, this series of six volumes constitutes Henry Mayhew’s complete Morning Chronicle survey, in the sequence in which it was originally written in 1849 and 1850. It addresses a wealth of topics from cholera in the Jacob’s Island area to the food markets of London. The publication of this complete survey represented the first time in which the whole of Mayhew’s pioneering work was available in one place. The set is introduced by Dr Peter Razzell, who was co-editor of the national Morning Chronicle survey. This fourth volume contains letters from March to May 1850. This series will be of interest to those studying the history of social welfare, poverty and urbanisation.